These pretty ladies were spotted at the Wellington City Libraries stall at Wellington Zinefest 2011, which happened last Saturday at Mighty Mighty. We bought heaps of new local zines at the fest, so come down to the zine collection to check them out in the next week or so! Carla, Vita, Jeremy and I are excited to be taking part in another Wellington Zinefest (It’s totally the highlight of the zine librarian’s calendar!) Vita is on the organising committee and tells me that there are more stall holders than ever before – so you are practically guaranteed to find the perfect zine for you! And you know what? If your budget won’t let you buy all the glorious zines you want then you can always borrow zines from the Library stall. It’s almost the same as owning them (except that you have to bring them back to us in 4 weeks time!) What about it? Will we see you there? 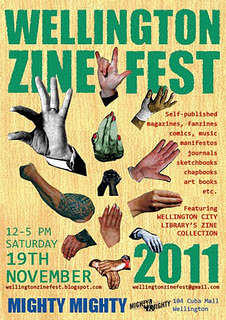 Just in case you haven’t heard – stall-holder applications for Wellington Zinefest 2011 are now open! 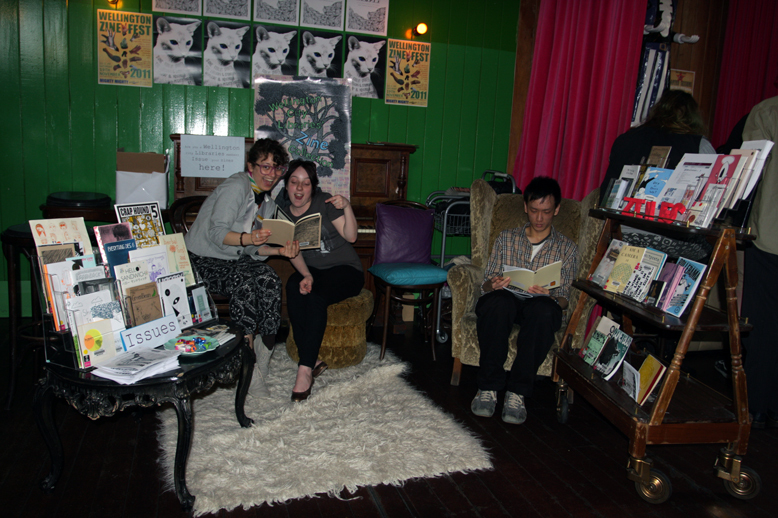 You can find the registration form at http://wellingtonzinefest.blogspot.com/. And let us know if you’re in a band, as we’re looking for some zine-making musicians to play at the after-party.